I recently had the privilege of speaking with Erin Bittner, from Pierce Hardware in Dallas, Texas, that began as a spotlight interview but ended up becoming an insightful discussion about our industry. I first met Erin at the DPHA Showcase in Nashville, TN in October of 2016 and found him to be very passionate about the decorative plumbing industry, which resonated in the round-table segment of the weekend. Personally, I learn the most when I engage in discussions that revolve around business ideas and strategies with colleagues. There is so much we can learn from each other, and implementing these talking points can become a catalyst in strengthening the value of our showrooms and businesses in the current market. I hope you all enjoy the interview as much as I did. Erin Bittner is the C.O.O. of Pierce Hardware and JCR Distributors, which has Pierce showroom locations in Dallas and Fort Worth, Texas, and he has been in the DPH industry for the past 15 years. Phil Hotarek: What do you see as the biggest surprises about our industry? Erin Bittner: The value and power of strong relationships, how complex product offerings are and how challenging product integration into the construction of the home really is. The necessity to employ a quality professional who has tremendous product knowledge and experience matters! Phil: The most challenging aspect of our industry? Erin: Keeping up with the constant change from manufacturers to reps. New price books, new displays, product discontinuations, price changes, etc., certainly make our jobs challenging, not to mention trying to utilize co-op funds to promote quality brands alongside our own branding efforts. Phil: Any success stories you would like to share? Erin: Our company was generously converted to an ESOP (employee owned), which had to be fronted by our former owner Mike McKenzie during the great recession. It’s hard to convey the value of what Mike did for this company – he carried a large financial risk for the benefit of longtime employees. He saw value in their tenure and experience and had a vision for how well that value would translate into an employee owned entity. That’s a huge success story! Phil: If there is one thing you can sell, it’s…? 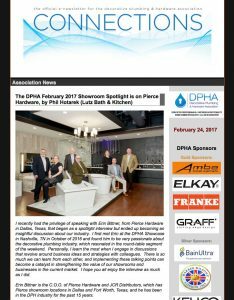 Phil: Have you registered for the DPHA Recognition Program yet? Erin: Yes. All our new employees have been registered. The Recognition Program at first was found to be complex and confusing because employees thought that simply going through the quizzes was the recognition program itself. We are rediscovering how much the program, as well as DPHA, itself has to offer. I strongly encourage your showroom managers to reach out to the team at DPHA to review the tools available through the Aassociation you can use immediately. Phil: Have you completed any category tests? Erin: The team has. I have a personal goal to finish 5 classes in 2017. Phil: How have you benefited from participating in the Recognition Program, if at all? Erin: In addition to helping our new employees get up to speed, participation in the program aids in the mental discipline of constantly learning, even if you are already fairly knowledgeable. Our team’s knowledge and experience sets us apart, so continuing education is essential to our future. Just try to pass Jim Babbitt’s 21 question sample quiz and you may be humbled on what all you could learn or re-learn. Phil: Is that face-to-face or online training? Erin: On-line and face-to-face. It depends on the subject or the quality of the online material. Phil: What are some key factors that set you apart from other showrooms? Erin: We closed down our historic showroom in a boutique shopping mall area (retail space, 1500 square feet of showroom space) and moved everyone to a new location next to Love Field in Dallas, a more industrial area that allowed us to create a much larger showroom (more than triple the previous size). People are now able to see both plumbing and hardware for the entire home. We are currently remodeling the Fort Worth showroom and we continue to invest in our employees as owners. The showroom is designed in such a way that the displays and decor can be frequently changed. We show exclusive brands and products you can only see at Pierce. But at the end of the day, the quality, tenure and knowledge of our team is what matters most. Phil: How do you compete with the surge in e-commerce sales? Erin: We constantly promote and communicate the value of buying from a professional. Our actions must back up our words as well. We also use smart merchandising techniques to better convey the value of our authentic brands. We focus on making Pierce Hardware a destination for seeing the latest and greatest products in the world and creating the strongest relationship possible along the way. Phil: In your opinion, what do we need to do as an industry to further education in decorative plumbing amongst the masses? Erin: We need to formalize and scale the educational process so we can take people who have the right DNA to sell decorative products and put them through a system. We need to capture best practices from expert showrooms around the country and integrate them, and not limit to materials a manufacturer provides. A Rolls Royce may be the finest car made, but how you sell one every week is what really interests me! Having a formal program, yielding recognized credentials such as the ones architects, real estate agents and/or designers have validates the credibility of what showroom professionals are offering. It could also lead to other elements such as certain manufacturers selling only to accredited qualified showrooms. We live in a society where everything can be purchased online or is accessible through an app right at your fingertips. An experienced professional saves the consumer time and hassle in addition to providing unmatched support to the trade. Formalizing the education program may validate us as qualified professionals, providing a myriad of possibilities through recognition amongst manufacturers, reps, designers, and consumers. Phil: And just for fun, what is one thing your coworkers don’t know about you? Erin: I played the tuba from 3rd grade all the way through high school. I am sure there is a “hot air” joke in there somewhere. Phil: When your friends ask, “You sell toilets?” you say? Erin: Yes, lots of them, we sell the coolest potties you’ve ever seen!